Elites of the Army of the Kingdom, the Guardians are the shock troops of the Army. 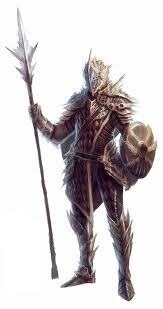 They work in teams of twenty hardened fighters, all armed with plate armor and a weapon of their choice. The Guardians are also the protectors of the Council, and the King, and form the elite guard of the Five Generals as well. Guardians are experts with the blade, giving them abilities that where long since believed unique to the Order of the Way. This allows them to use any blades weapon masterfully, adding to their deadliness in combat.